It triggered a memory of a conversation year’s ago at SAPPHIRE with an executive of a steel company in the US. This is a huge change for company culture and business meeting, he emphasized, as he showed me his iPad with live analytics data from his productive systems. Today, rethinking a month of transformation discussion with many other metals and mill product companies, I was amazed to see this still being a major issue with companies. One building materials company I talked to had grown aggressively through acquisition resulting in a multitude of ERP systems, manufacturing systems, telematics and logistics solutions, a quoting solution, and a separate system for managing recipes. As they stated it, they have no insights into profitability – by order, by customer, by project – and thus struggle with making fact-based business decisions. A leading producer of flat steel evolved building systems onto systems through continuous innovation & improvement. I was impressed by their deep analytics on profitability, yield or scrap by grade, customer, and individual configuration of recipe and production machines. Having this real time, even within a shift – and not just looking back after each quarter – seemed out of reach. One repeating conversation is the impact of tariffs and trade regulations, changing legislation on environmental issues, or simply energy prices. How good are metal and mining companies with preparing for the hard-to-predict – on demand, supply, profit? Do they plan for alternative scenarios as part of their S&OP process? It’s worthwhile to take a closer look at this from an industry perspective. In a previous blog I talked about S/4HANA’s core data services, the CDS views, and howhttps://www.sap.com/documents/2017/04/16ceda0b-b37c-0010-82c7-eda71af511fa.html to deal with our flexible industry data model based on variant configuration and batch classification. In this blog, I would like to talk about SAP’s cloud for analytics, and the digital boardroom, and especially the industry-specific analytics content available. First of all, I would like to point you to the reference blog with all up-to-date information and more details and links if you have questions on SAP Analytics Cloud and its content. The most relevant latest content release for our industries (mill products, metals, construction suppliers & building materials) is the content innovation 7 which is available in the content library. I recommend to actually look beyond just the Mill Products content. There are other lines of businesses and industries that are highly relevant, and that you can combine and make use of. Make sure to check out the comprehensive rollout slide deck for more information on the available packages and their content. Analyze the financial performance including detailed information on Profit and Loss, Net and Gross Profit Margin, Earnings and Expenses for the current year. Assess the product portfolio performance of business units with respect to contribution margin by material groups and configurable products. Analyze best- and non-selling configurable products to drive production planning decisions. Identify increased usage of lower quality grades and average weight per order within the customer base to create customer-tailored sales incentive programs. Assess the opportunity pipeline as an indicator for future business health. Analyze incidents and the root causes for injuries. Provide transparency into the company’s greenhouse gas emission reduction target. Monitor key information related to the workforce and recruiting. We have delivered Mill Products specific content in Content Innovation 4 and enhanced the content further in CI7. Specifically in CI7, we delivered additional content to review the production performance of a configurable product portfolio with regards to quantity, scrap, operation duration and costs of production orders. Let’s take a glance under the hood of the content, and why this is a) helpful and b) slightly special. Core Data Service (CDS) views are SAP’s strategic modeling approach for business entities. You can benefit from pre-delivered CDS cube and query views to – for example – analyze sales order data. However, in case you want to analyze classification/configuration data, SAP cannot deliver CDS cubes upfront. The classes and characteristics for Classification/Configuration originate in the customer system and additional steps are required. Instead of delivering the CDS views, SAP provides generation reports that you can run in your system to create the required CDS views. Please find in the following notes more information how to do this in detail. 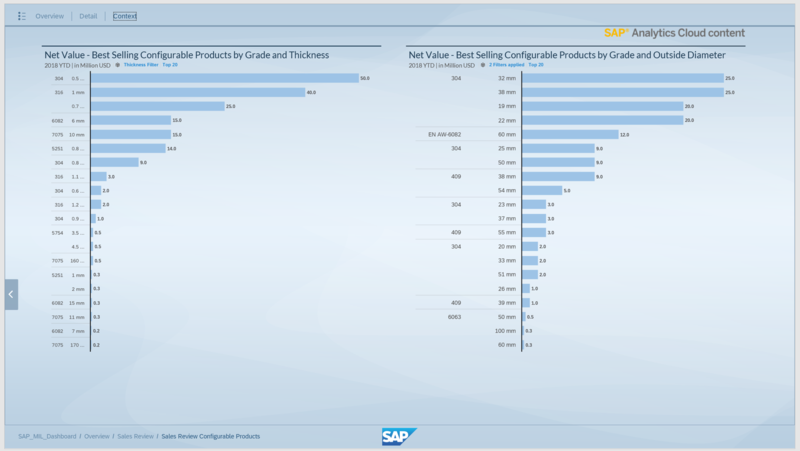 The industry content for mill products shows nicely how all the pieces seamlessly work together from the digital boardroom or SAP Cloud for Analytics down to the SAP S/4HANA CDS views for variant configuration. 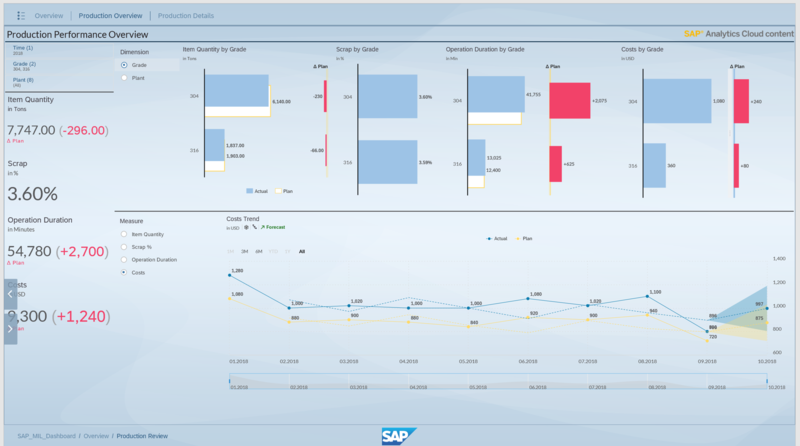 If you would like to run embedded analytics directly in SAP S/4HANA, the same CDS views apply. And with SAP S/4HANA you would not even have to duplicate your data into the analytics cloud, but directly execute your queries locally. Smart isn’t it?